2019 Identity Protection Forecast The Next Frontier for FinTech Lenders is Their Own Customer Base. FinTechs thrive by offering a better alternative to traditional financial institutions. They reduce the friction that consumers often experience in dealing with financial institutions, lower the costs, and engage consumers with a better, more personalized customer experience in digital and mobile channels. Yet they still face the same challenges as any business: a highly focused product or service designed to address just one aspect of the customer’s life ­– in the case of FinTechs, one aspect of their financial lives. Found it difficult to disentangle credit reports and credit scores. Said they knew about the three largest nationwide credit reporting agencies, but were hard-pressed to name all three. Were puzzled when they encountered differences in information across their various reports. In a recently conducted Experian survey, we found that nearly one in four respondents had never obtained their credit report or score. The knowledge gap can be expensive for them, resulting in high interest rates, fewer rewards, and the inability to qualify for the things they want in life. 24% had received insufficient educations about the habits and techniques required to build a strong credit history. 15% surveyed said they regularly miss credit card payments. 43% described their credit card debt as unmanageable. Get our free guide to driving growth through Credit Education by clicking here. The issue becomes particularly anxiety-producing for this generation when you factor in the enormous student loan debt that they’re currently shouldering. CNBC reports that, “Roughly 70 percent of grads leave college with student debt, and over 44 million Americans hold a total of $1.4 trillion in student loan debt.” The situation is only getting worse. Average loan debt skyrocketed by 20% between 2015 and 2016 and continues to climb today. That said, they’re generally eager to learn more about how to improve their creditworthiness. According to a 2017 survey conducted by LendEDU’s, nearly 70% of millennials reported that they wanted to build their credit histories. The survey also showed that millennials have more credit cards than they should and tend to rely on them for basic expenses more than they should. Give them access to their many credit reports and scores. Deliver alerts that help them understand credit score fluctuations. Offer them tools to help increase their credit literacy and confidence as well as protect themselves from identity theft. A recent Experian study found that credit scores were an average of 14 points higher for people receiving credit education. Additionally, the number of credit inquiries and external collection trades for these individuals were down 9 percent and 21 percent respectively. These newly educated consumers are taking action and moving up in the credit world, making them more valuable to financial institutions. Financial literacy and credit education services can deepen customer relationships, establish loyalty, and help FinTech companies solidify their place in the lives of their customers. As one of the largest credit bureaus and a leading global information services company, Experian is uniquely positioned to offer solutions to help your customers navigate life’s most significant and challenging financial decisions, while also building your business. Want to improve your FinTech’s acquisition efforts? Talk to us about adding our innovative credit education solution including credit scores, score updates, simulations, fraud alerts, monitoring, and much more. It’s remarkably easy to implement (under 60 days). Help your customers be financially successful and grow your business at the same time. 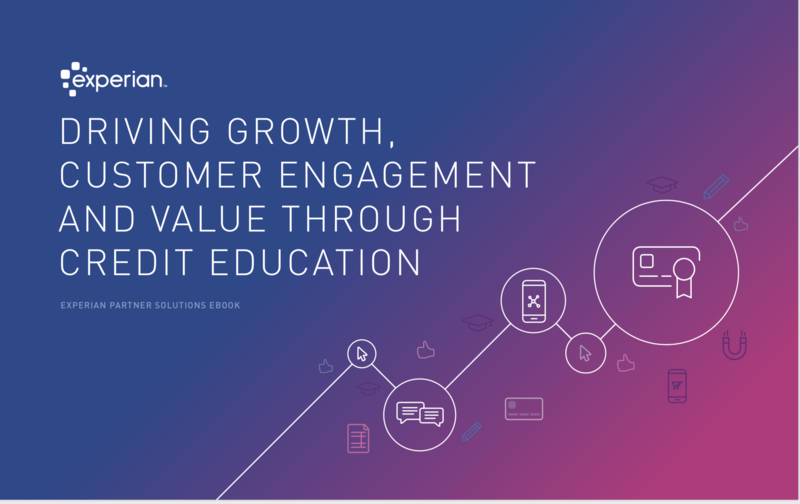 Get more insights from our latest e-Book: Driving Growth, Customer Engagement and Value Through Credit Education.